Steep terrain and strong variability in surface temperatures are typical of mountain permafrost. The cross section in the foreground shows the complex distribution of subsurface temperatures characteristic of mountains, with the isotherms (lines linking points of equal temperature) nearly vertical in the ridge of the mountain. 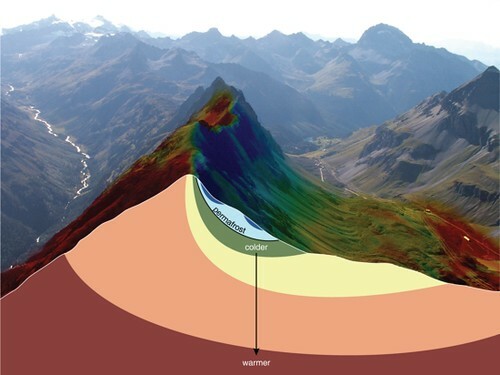 In the background, the colours on the mountain surface illustrate the strong variability in ground temperatures caused by differences in elevation, exposure to the sun, snow cover and ground properties. In the far background, one can only guess at this complex pattern of permafrost distribution because permafrost is invisible at the ground surface. For any form of publication, please include the link to this page and give the creator credit (in this case Stephan Gruber, University of Zürich. Hugo Ahlenius, UNEP/GRID-Arednal) If the high-resolution file is not available, please contact grid@grida.no for request and permission for usage.